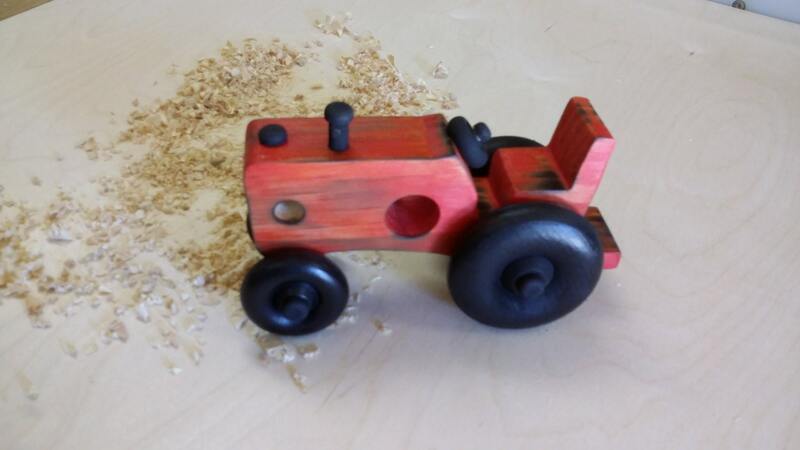 Every little farmer needs a tractor. Comes in several different colors. Please choose from drop list. Made of solid pine. All the wheels turn and the steering wheel turns. Know your child and buy accordingly. This bench is beautifully made !! I was so proud to give this as a gift ! Love this. Puzzle looks great. We accept PAYPAL, which in turn will accept your credit cards; even if you do not have an account with them. We believe this is the safest payment procedure for all parties involved. (Just click on PAYPAL and choose the option of paying without being a member). Please make payments within 5 days of placing your order. We do not ship until payment is received. Thanks! We want you to be delighted with your purchase! If for any reason you are not satisfied, please email us with your concerns! We value our customers and work hard to keep them coming back ... and telling others about our little shop! All return shipping will be paid by the Buyer. For U.S. DESTINATIONS, we use USPS Priority Mail ,First Class or Parcel Post (Larger Items) so packages should reach you in 2-3 days, depending on your location. Larger items will be shipped by parcel post and may take 7-10 depending on the size of the item. For CANADIAN DESTINATIONS AND OTHER INTERNATIONAL DESTINATIONS, please contact me for information on shipping. We can set up A CUSTOM ORDER if you are interested and the shipping is reasonable for you. We would be most happy to work with you! If you prefer, we can mail your package to another address for ease in gift giving. Be sure and indicate the address in the message section when you pay. We will include a gift card if you wish; just convo/email us with the specific details and message for the card. We will be happy to take care of it! PLEASE NOTE: We take great care in providing the safest product possible, but as with any toy, children should always be supervised. We are not responsible for injury or mishap while using our toys. "Time spent playing with your children, is the best investment you will ever make."